Not to be an alarmist, but the rate of diabetes, both Type I and Type II, in the US is on the rise. The 2011 National Diabetes Fact sheet published by the Centers for Disease control and the American Diabetes Association estimates that 25.8 million people, or 8.3% of the U.S. population, have diabetes (18.8 million people already diagnosed with Diabetes and at least 7 million people who remain undiagnosed). In addition, there were 1.9 million Americans diagnosed with diabetes 20120 alone! One of the main problems with uncontrolled diabetes is a loss in sensation to the feet and legs, what we physicians called neuropathy. Since we are all busy people and the demands of the day require us to be on our feet, a diabetic may overstress their bones, causing them to break without even realizing it. Walking on a numb, injured foot can cause the numerous bones in the foot to crack, splinter and erode away. Over a period of time then, the affected foot can take on a deformed appearance as joints and change position/shape to adapt the stresses placed on it. Eventually this change becomes permanent as the bones coalesce to their new shape (i.e. become rigid). Sometimes this becomes so severe that the foot takes on a completely new abnormal shape like in the picture shown. This is called a Charcot foot. Although it may look like an infection, with appropriate training and testing, a physician can accurately diagnose this condition for what it is thus allowing us to treat it. Therefore, the best medicine in dealing with Charcot feet is to prevent them from happening in the first place. Adequate control of your blood sugars as well as daily inspections of your feet and routine visits to your podiatrist’s office is necessary in preventing problems from arising. 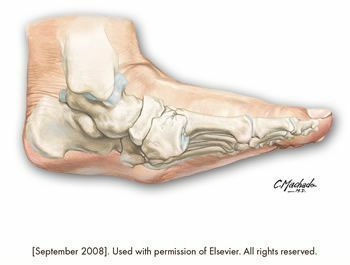 If Charcot does end up occurring, for example you have a painless red, hot and swollen foot, then adequate diagnosis followed by rapid treatment by your podiatrist can prevent further issues from arising. The podiatrists at Family Foot & Ankle Specialists have years of experience in diagnosis and treatment of not only Charcot but all types of foot and ankle ailments. If you are diabetic with or without neuropathy and think you may be developing a Charcot foot, see one of our podiatrists today to get the very best diagnosis and care of your feet.